Lacrosse is referred to as ‘The Medicine Game’ by it’s creators the Iroquois Nation. It receives this moniker because of it’s spiritual and therapeutic aspects. To the Natives, it is an expression of their faith to the creator; something bordering on religion. But this title is more literal for some, notably Nick Wallace. 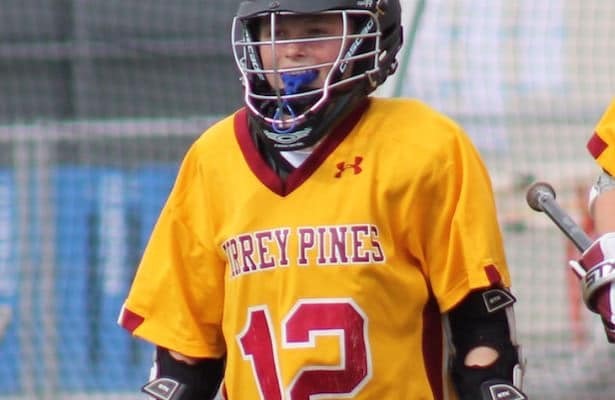 Nick is a current member of the Torrey Pines High School lacrosse team, and runs his own charity. He is also dealing with a chronic life threatening illness known as Biliary Artesia, a pediatric liver disease that has been plaguing Nick since birth. But, fortunately, Nick has some great medicine: the game of lacrosse. MaxLax caught up with Nick to hear his story, see what his charity does, and promote this dynamic advocate for the game. MaxLaxSD: Can you give us a quick backstory? When did you get into lacrosse and what’s the journey been like? NW: I started lacrosse when I was in the fifth grade. Originally, I started as a defender because of my liver issues, my doctors didn’t want me playing offense. When I first started to play lacrosse it was hard for me. Not because it was a contact sport, but because I was always out sick and it stunted my development as a player. It’s hard to get better when you are always out sick. It was also hard to adapt to playing a contact sport after a lifetime of avoiding hard contact with others. Because of my liver disease (biliary atresia) my liver and spleen were abnormal. I had to be extremely cautious about contact with others and in order to play I needed to be equipped with custom made hard shell protective gear. Now that I am post transplant my spleen and liver are normal in size and there is no concern at all about me taking a hit. Now, I am not at risk anymore than any other player. However, I do still wear the hard shell protective gear. MaxLaxSD: Do you find lacrosse is a good way to stay constant and grounded in your life when things get crazy? NW: I have found that lacrosse is a way way for me to “stay in reality” I used to spend a lot of my days wishing things (my illness, the hospitalizations and all the procedures) were just a bad dream. Lacrosse was like my way of waking up. It has helped me realize there is light at the end of the tunnel, which can be hard when it seems that your life is a series of tests and infections. Even though I have received my transplant and I am healthier I still have health concerns. I have had some rejection and have an increased risk of infections. It can be a struggle, but I am strong and it’s worth it because I love the game. MaxLaxSD: Who are some people in the lacrosse world you’d point to as role models and people that have helped you along the way? NW: I would have to say Kevin Mahoney, who played lacrosse for Notre Dame while waiting for a liver transplant was one of my first lacrosse mentors and favorite people. He came to the hospital for my transplant and is really supportive. Coach Kevin Corrigan from Notre Dame and Coach Tom DeMaio from Team 12. They have all helped me in different ways, some giving me opportunities to play when I had nothing else to do because of my health. In some instances helping me find my way through life. Coach Zissi from Torrey Pines has really been great. He has given me the opportunity to play and improve my skills. Mostly, he has made me feel included and proud to be a member of the team. They have all made me work harder and be a better player. MaxLaxSD: What about the charity you started, Nick’s Picks? What does this organization aim to do? NW: Nick’s Picks is a 501c3 that I started to help other kids dealing with serious illnesses and hospitalizations. We have dedicated ourselves to providing lacrosse themed, fun-filled backpacks loaded with the 10 (now 11) items I (and other kids) found most fun and useful on isolation. I have always prided myself on being a master at keeping myself entertained. Each item is hand selected and were the items I loved most, and found the most useful, especially when I was on isolation. Included are items such as a Boogie board LCD writer, Hoven vision sunglasses, Baden basketball hoop, No button, flashy lacrosse socks and more. MaxLaxSD: Why do you feel doing this is important? NW: When I was in the hospital I felt there were many aspects I wish I could improve. I knew couldn’t do this easily, as a hospital is a large organization and I am just one kid. I knew I had to do something, and if I couldn’t change their illness, I could try to make it better for as many kids as possible by making them happier. That’s what the backpacks do, they provide happiness in a very dark time for these kids. I also feel its important because philanthropy is inspiring to others.I spoke about the “epidemic of compassion” at UCLA which I hope to perpetuate to really bring people together. It’s heartwarming to read the emails and letters I have received from patients and family members thanking me for the backpacks. I have received amazing support from sponsors and as word of my mission has spread so many people have come forward to help and be a part of my purpose. The lacrosse community, from Matt Holman of EMW Foundation to SDSU’s mens lacrosse, Adrenaline and my coach teammates from Bunch Nation Team 12 and Torrey Pines Lacrosse have all joined in to help make a difference. MaxLaxSD: Have Bunch Nation and Torrey Pines been helpful? NW: Team 12 and Torrey Pines have been amazing. They have not only given me opportunities to play, but they have helped keep me grounded, providing me with camaraderie and a fellowship that is so important. Coaches Zissi (Torrey Pines) and De Maio (Bunch Nation 12) have been great mentors, trying to help guide me. MaxLaxSD: How does TP look this year? Every year you lose some many great players to college. But, in spite of that I think Torrey Pines is going to have a great year. I hope to be part of a great time.Torrey Pines always shines! MaxLaxSD: Any lacrosse idols you want to give a shoutout to? What is it about these players you try to embody in your own character and your own game? NW: Definitely. Kevin Mahoney will never know what his friendship has meant to me. He lived my life before me in that he has experienced so many of the challenges I have and will still face. He has taught me not to give up, and so be courageous in the face of adversity. I want to follow in his foot steps. I now mentor a kid named Trent Boaz who also has biliary atresia. I hope I can inspire him like that. Matt Holman has been an incredible support in my local community. He was a savior to me in someways. Before transplant I was so sick and I didn’t know if I would get the liver I needed. I was missing so much practice because of all the complications and infections. It was really hard and coach Holman and the SDSU lacrosse team really embraced me. They would have me practice with them and even made me an honorary captain. Matt Holman taught me so much about being a compassionate person. Coach Corrigan of Notre Dame had been great to me. I went to visit him and the team soon after my transplant and fell in love with Notre Dame. I go to lacrosse camp in the summer in South Bend Indiana and the Notre Dame campus is one of my favorite places on earth largely because of coach Corrigan. He has made me want to be the best player I can be and has driven me to be as strong and determined as I need to be to live my dream. He has taught me so much about the fellowship and team spirit that goes into a great team My Torrey Pines coach, Jono Zisso has been so great. He has made me feel included and like I am actually an essential part of the team. He has given me opportunities to play and improve my on-field skills that carry over to Team 12 as well.